Find a new root in your box this week! It’s tan, and looks a bit like a ginger root. It’s actually Sunchoke, which is related to Sunflowers. High in iron, also contains Thiamin, Phosphorus and Potassium. It is a sweet, crunchy tuber that can be eaten raw or cooked. Best stored in the refrigerator, in an airtight container or bag, for 1-2 weeks. You can peel it if you like, but the skin is edible. Sunchoke naturally contains Inulin, which is a soluble fiber (it is a starch that is not digested). Some claim inulin has health benefits, feeding beneficial bacteria in your digestive system, while some link overconsumption of inulin (which can be added to processed foods to replace other types of sugars and starches) to digestive discomfort. 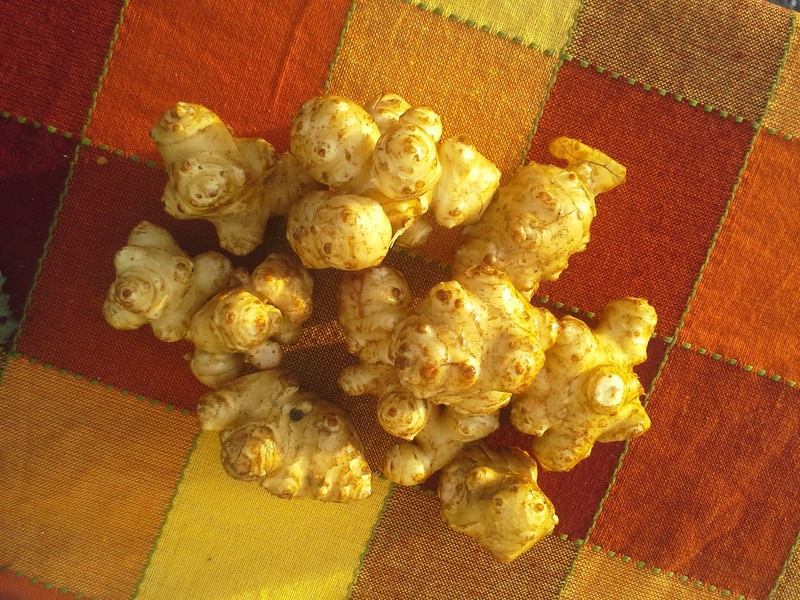 If this is your first time eating sunchokes, we recommend cooking them thoroughly, for example, in a soup or baked dish. Here are several recipes you can try from Bon Appetit.